Located roughly in the middle of Jutland, slightly further east than west, is a mountain that reaches right up to the sky! Every year, 300,000 people visit Himmelbjerget and the beautiful surrounding countryside. If you are touring Central Jutland, you have to visit Himmelbjerget. Is Himmelbjerget Denmark's highest point? It hardly comes as a surprise to anyone that Denmark is a flat country. Of course we have hills all over the country, but you have to look hard to find mountains. Maybe that's why Himmelbjerget appears so high? When you stand on top of the mountain you are 147 metres above sea level. Up until 1847, Himmelbjerget was believed to be the highest point in Denmark until a nationwide survey dispelled this assumption. It was discovered that Møllehøj, not far from Skanderborg, actually takes the title of Denmark's highest point with its height of 170 m.
One of the most popular ways to get to Himmelbjerget is on the paddle steamer Hjejlen. Hjejlen sails through the gorgeous Silkeborg islands and since 1861 has carried tourists and other visitors to Himmelbjerget. Enjoy a quiet moment as well as a beautiful trip on the boat, the oldest steamship in operation in the world. 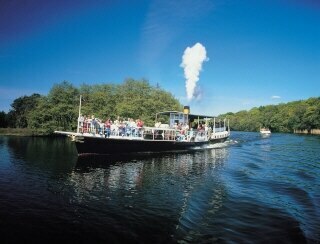 During peak season, Hjejlen sails up to 7 times a day from Silkeborg to Himmelbjerget. If you're looking for a hotel in Silkeborg and close to Himmelbjerget, we recommend Scandic Silkeborg. Our hotel is located in the heart of Silkeborg's wonderful countryside overlooking Lake Silkeborg Langsø. This is the perfect starting point to explore Silkeborg and all the opportunities offered in the nearby area. We live in such a small world that by the time you grow up you'll no doubt have explored many different countries. So spend your holiday showing your kids Denmark.